The one thing that everyone remembers about the John Wick movies, other than Keanu Reeves, is the Hotel Continental, a sort of Switzerland re-imagined as a five-star hotel, where evildoers can relax in style, free from the fears of being killed by one another. 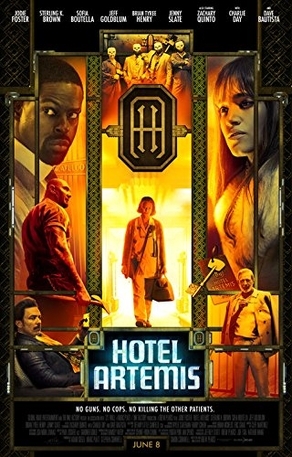 For those who may have wondered what the Hotel Continental would be like as a dumpy hospital rather than a luxury hotel and was run by a superannuated Jodie Foster instead of the always suave Ian McShane, you now have the answer in the form of Drew Pearce’s highly derivative Hotel Artemis, featuring a titular establishment that is to the Continental as, well, the movie Hotel Artemis is to John Wick. The plot of Hotel Artemis features a hodgepodge of ideas, about half of which are decent, resulting in a movie that is about half decent as well. The hotel itself is a dilapidated structure (that nonetheless features a highly noticeable neon roof sign) in a seedy portion of Los Angeles in the year 2028. Would-be patrons take a rickety elevator up several floors (I kept expecting it to open and reveal David S. Pumpkins) to the “guest rooms,” where the two-person staff checks them in for their stay (see clip below). The hotel boasts a lengthy list of rules cribbed from Wick’s Continental, including no guns, no cops, and no killing of other guests, and, although it does offer refuge to criminals on the run, it’s more of a hospital than a hotel, with the chief attraction being state-of-the-art medical care delivered by the Nurse (Foster) and her assistant/bouncer/jack of all trades Everest (Dave Bautista). Criminals in essence pay a healthy insurance premium for the right to check into the Artemis when needed, but they get some high-tech goodies for their dollars, including a 3D printer that can make a new body part when needed or nanobit robots that can do just about anything else. Although the Artemis looks as spacious as Stephen King’s Overlook, apparently those looks are deceiving, since the four guests in the hotel this evening overtax its capacity. First there are thieves dubbed Waikiki (Sterling K. Brown) and his hothead brother Honolulu (Brian Tyree Henry), who was badly wounded when a Reservoir Dogs-style heist in the film’s opening scene goes wrong. Then there is Acapulco (Charlie Day), playing the usual Charlie Day obnoxious jerk, and Nice (Sofia Boutella), a hitwoman waiting on her target to arrive and reminiscing about old times with ex-boyfriend Waikiki. Last to arrive is the Wolf King (Jeff Goldblum), the local crime boss who actually owns the Hotel Artemis and is in bad need of its services after having been stabbed. Hotel Artemis is the brainchild of screenwriter turned first-time director Drew Pearce, who says he wrote what he wanted to see. If that’s the case, then he could have saved himself a lot of time and money since much of what’s in the movie has been seen in better version in better movies many times previously. The medical emergencies here resemble a typical episode of Code Black with some futuristic gadgetry. Similarly, the idea of putting a group of widely disparate people under the same roof (so to speak) for an hour or so kept The Love Boat afloat for years, with a typical episode being quite similar to the rather clichéd storylines in Hotel Artemis, albeit considerably less bloody. The only character given a genuine backstory is the Nurse, who we learn lost her child years earlier, which changed her life around and led to her pulling late shifts at the Artemis. Whether that character backstory was to attract Jodie Foster to the project (her first film in five years) or whether she demanded a meatier role, the more time spent with her character makes it sappier than anything else. At the worst of times, Hotel Artemis resembles a cross between a Pulp Fiction ripoff and a rejected Love Boat script. At the best of times however, it’s more Tarantino-lite, with some eye-popping bits of action, occasionally great quips, and kicky and kitschy production design. The bulk of the quips come, as might be expected, from Jeff Goldblum, who is hopelessly miscast as a ruthless crime boss but always a good source for Goldblum-isms (“Without the rule breakers, where would you be?”) or from Foster (“ This is America. Eighty-five percent of what I fix is bullet holes.”) On the other hand, the bulk of the action is courtesy of Bautista and Boutella, who, between them, beat the stuffings out of a couple of dozen of the Wolf King’s goons led by his oafish son (Zachary Quinto). The good parts of Hotel Artemis bring it so tantalizingly close to becoming a great camp guilty pleasure that it’s frustrating to see it fall apart over and over again. The two biggest problems I had with the movie were the facts that it took itself far too seriously at times and it tried to juggle too many plotlines, most of them not nearly as interesting as director Pearce seems to think. John Wick never took itself seriously, so it worked; the closest thing to real drama was Wick mourning the loss of his dog. Here, there are three or four plotlines, most involving Jodie Foster, that compete unsuccessfully for attention. I can’t in good conscience recommend Hotel Artemis, even to those who love this type of mindless escapism. The film delivers plenty of action, with the scene involving Boutella wiping out a dozen attackers almost worth the price of admission alone. And the quality of the cast (with the notable exception of the always-annoying Charlie Day) helps it get through some of the rough spots. But ultimately, there are too many rough spots, and, like the hotel itself, the film shows the rather frayed nature of the script and concept at times. This is one hotel that won’t make the grade with TripAdvisor or with audiences. In this clip, Jodie Foster keeps track of who gets to enter the Hotel Artemis.